I love the Kindle device! In this short read ebook, I’m going to take you through and teach you how you can publish your first Kindle book. Before we do, I want to give you a little background on why Kindle is such a big deal for independents, for entrepreneurs, for content creators, for coaches, for trainers, for consultants, for information product creators and Internet marketers. You’ll immediately want to dive right in to this incredible marketing and publishing opportunity, and I’ll show you how step-by-step. 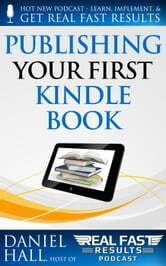 Based on the Real Fast Results Podcast, Show Number 1, Publishing Your First Kindle Book - available on iTunes. How to Market Mobile Apps: Secrets to Making Money with iPhone, Android, & Blackberry Apps! Video Marketing Excellence: Discover The Secrets To Video Marketing And Leverage Its Power To Bring Countless Targeted, Relevant Visitors To Your Offers ... Video Marketing Is One of The Fastest, Easiest Ways To Earn BIG as An Internet Marketer! Zen of Technology - Stress-Free Email: Do email better - with efficiency and no stress.